I could not ask for a more rewarding career. Being an orthodontist allows me to create healthy, beautiful smiles and improve the self-esteem of so many people! I am fortunate, as my profession brings me into contact with so many remarkable individuals. We build long-term relationships that go beyond provider and patient: we become friends and I appreciate the uniqueness of each person in my care. Their conversations broaden my world and their smiles warm my life. I’ve been practicing orthodontics for more than 25 years. I have a brother who’s a dentist, a brother who’s a physician, and a brother who was a chiropractor; my mother was an occupational therapist; my uncle was a surgeon, too. You could say medicine and helping others runs in my family! 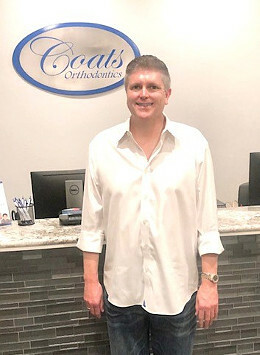 Before starting to practice orthodontics, Dr. Coats achieved a Doctorate of Dental Surgery (DDS) degree and a Master of Science (MS) degree. He has extensive knowledge of both general dentistry and orthodontics. This allows him to deliver the beautiful smiles of patients’ dreams and ensure the best function for lasting oral health. Each year, Dr. Coats completes many hours of continuing education. By staying current on technological advancements and new techniques and materials, he provides each patient with the right care approach for their specific clinical and personal needs. A native of Arlington, Dr. Coats now calls Tomball his home. He has two amazing children: Lauren is a special needs adult and lives in a group home in Texas. Landon is a graduate of the Orange County Art Institute. Landon is currently working in his field of expertiece, digital film. When not spending time with his patients, Dr. Coats enjoys being with Lauren and Landon. He likes watching movies, attending the theater, and dining, along with woodworking projects and antiques. He is also actively involved with his church.